On May 20, 2009 the Utah Division of Oil, Gas and Mining (UDOGM) approved a plan of operations by an Alberta, Canada mining company called Earth Energy Resources (EER) to commence the strip mining of tar sands (bitumen) in the Uinta Basin of the Colorado Plateau. STATUS: The application to begin mining operations has been challenged by Living Rivers and their attorneys Western Resource Advocates. The application for a Conditional Use Permit from Grand County has yet to be submitted by EER. The first formal hearing was February 23, 2011 with Utah Division of Oil, Gas and Mining and the next scheduled meeting is May 16 & 17, 2012 with the Utah Division of Water Quality on May 16 and 17, 2012, and each day, the hearings will begin at 10:00 a.m. and end by 5:00 p.m. Address is 195 North 1950 West; Salt Lake City, UT 84114-4870 (stipulations). Read article by the Associated Press that had considerable coverage in the nation. The plan will blast and chew into the slopes of canyon headwaters at possible depths up to 500 feet. The overburden and waste rock (sand, clay, and rubble) will then be placed back into the empty cavity and adjacent valleys, and then sprinkled with top soil, mulch, seeds and prayer, with hopes the infamous winds & cloudbursts of this high plateau won't wash and blow it all away (photo of debris flow in Uinta Basin). Nevermind the weed crop that will actually replace this landscape of sage, Gambel oak, pinyon pine, aspen and Douglas fir. A habitat ideal for wildlife populations such as elk, deer, bear, bison (recently introduced), turkey, nightjars, grouse and owls. The pretty pictures on the ERR website leave readers with the impression that the landscape will actually be improved by their handsome visits. The proposal includes processing the bitumen into a liquid at the mining site so that it can be trucked to Salt Lake City where it is typically refined into kerosene, diesel and aircraft fuel. The on site sand/bitumen separating process uses a concentrated citrus-based solvent mixed with hot water. Even though the solvent is strong enough to liquify tar, EER says the chemical signature is harmless to the environment. When asked to reveal the chemical signature of the solvent, EER claims it does not have to reveal proprietary company secrets. The chemical has to be replenished during processing and that which is lost ends up in the unlined waste pit where it is exposed to percolation from rain storms, which will carry it into the aquifer or into stream beds. The chemical is also expensive ($36 a gallon) and there isn't enough citrus in the world to support large scale tar sands mining in the first place. The other speculative part of this proposal is the limited groundwater available for processing. Water that is not saline is hard to come by in the Uinta Basin. There are shallow aquifers in the mining area, but the quantity is anything but sufficient. EER will have to chase water and drill more wells as they exhaust their supply time and time again. The Uinta Basin (map) is in the northeast corner of Utah and the northwest corner of Colorado. Some people refer to the Uinta Basin in Utah as the Tavaputs Plateau or the Book Cliffs. 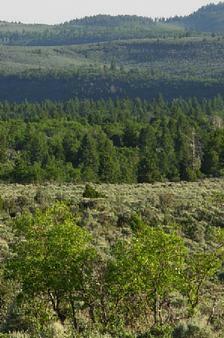 In the state of Colorado the Uinta Basin is also known as Piceance Creek Basin or the Roan Cliffs. This geophysical subprovince is loaded with kerogen and bitumen embedded in sandstones and shales of the Green River Formation (report). Various documents claim there are more hydrocarbons in the Green River Formation, which also extends into Wyoming, than in Saudi Arabia. However, the reason why oil bearing rocks have never been extracted here before, is the high cost of production and the general lack of water for processing (report). This is the first serious application for large-scale extraction of tar sands in the United States, outside of experimental and small town asphalt operations. The proposed mine will affect the watershed of the Green River, which is the major most tributary of the Colorado River. The Utah counties affected are Grand County (Moab is the county seat) and Uintah County (Vernal is the county seat). The national parks in the vicinity are Canyonlands, Arches, Dinosaur and Colorado National Monument near Grand Junction. The permit is for an area of 213 acres at a place called PR Springs (photos), but EER has leased a total of 5,930 acres of state land managed by School Institutional Trust Lands Administration (SITLA). There may be no federal nexus that would warrant a full Environmental Impact Statement, unless the mining operations move into federal lands managed by the Bureau of Land Management, which may or may not happen depending on when Congress gets real about climate change legislation. In the meantime, there is a Secretarial Order (and here) for federal agencies to adjust to climate change and reduce greenhouse gases. When the 24-hour a day, seven year project is complete, which includes blasting, ripping, hauling, primary processing and conveyance by tanker trucks over dusty roads to waiting refineries in air impaired urban areas like Salt Lake City, the contribution to the total US energy consumption per day will be a whopping 6 hours (here's the math). Ironically, EER will consume 2 of those 6 hours to produce the final product for market. Midnight shifts mean the blaring lights and noise will be seen and heard from Dinosaur National Monument, a federal reserve that has captured the most stunning canyon scenery in North America (photos here & here). In return the sole-source Colorado River watershed for seven states and Mexico get a mauled landscape, increased carbon emissions (3 times more than conventional oil production) and fugitive dust that will eviscerate the snowpacks of the Rocky Mountains and ensure the reservoir system will fail and foul. At this time, EER is reported to be searching for $35 million for start-up expenses and reclamation bonding, so mining operations have yet to occur. Additionally, an informal administrative hearing by Utah-based environmental groups this last winter resulted in a settlement to extend the public comment period more broadly. Furthermore, the government of Grand County will need time to implement a Conditional Use Permit (CUP) for these operations. The CUP from Uintah County has already been granted. Living Rivers and Peaceful Uprising recently protested this disaster-in-the-making at a scheduled informal hearing before DOGM administrators (news clippings) and it became very clear that nothing will stop this mine from proceeding because the state of Utah blatantly refuses to adjust to climate change by implementing renewable energy alternatives. They do provide some lip service to these policies, but only to answer critiques such as mine. The activists were advised by DOGM to take the matter up with the governor and the legislators. This is the same legislative body that has recently filed a lawsuit against the federal government with the hope the court will favor the handing of the public domain over to Utah. Nevermind that revenue from taxpayers from all 50 states is what built the basic infrastructure that allows Utah to function. The amazing thing about Utah's position as the ultimate deniers of climate change is their surface water yield is indeed declining despite a fully funded cloud-seeding program. Water conservation will never happen in Utah, until the goal of appropriating as much water as possible is achieved first. The Utahns that do drink water from the Colorado River basin, for example the folks of Salt Lake City and Provo, do not utilize surface water from the Uinta Basin. Their water comes from the slopes of the Uinta Mountains and the Wasatch Plateau, which is of excellent quality. The biggest threat to their water supplies is from the air pollution and greenhouse gases they themselves generate, which includes four oil refineries. For short-term particle pollution, Salt Lake City is #6 in the nation. Grand County has the largest proportion of state lands by county in Utah. In fact 15% or 550 square miles, and most of it is lumped where the tar sands and oil shale occurs (map - blue squares are state lands). How did this heavy oil reserve for state exploitation occur? As you are probably aware, the western states have a lot of federal lands that were never dispensed to individuals and corporations through various programs (for example the Homestead Act of 1862), and mostly for reasons of having no soil or water. Eventually enough people filled the western states so that its citizens could apply for statehood. Even after statehood, federal lands were dispensed to the public, usually to benefit returning veterans from the two World Wars. All programs of dispensement ended in 1976 (except Alaska for a period of ten years) when Congress passed the Federal Land Policy Management Act (FLPMA). Public lands are managed by various federal agencies for the benefit of all US citizens, though foreigners on holiday can visit these lands just as freely. Some of the public domain is preserved as national parks, monuments, wilderness and wildlife refuges, but the rest (the majority) has a multiple-use agenda and can be permitted by corporations and citizens to graze livestock, cut timber, or mine. At statehood, 4 of the 36 sections in a township (Public Land Survey System), were dispensed to the state government to generate revenue for state education programs. If the US Congress formally designates a national park, recreation area or wildlife refuge, for example, the state-owned sections within the designated boundaries are exchanged from the multiple-use sections of the public domain. Usually the exchanges are clustered to provide more economic opportunities for the state, and why there is such a large concentration of state lands in the hydrocarbon-rich Uinta Basin. If the nation is to adapt to cimate change by reducing greenhouse gases in the atmosphere, then strip mining low-grade hydrocarbons in the second driest state in the Union is not an appropriate way of demonstrating one's leadership skills toward intelligent land-use planning. Reduced streamflow is interfering with the goals and investments of regional water rights and delivery, salinity control and the recovery programs for endangered species. Corporations and government agencies must abandon traditional petroleum-based energy programs and invest their time and resources in developing energy products that do not conflict with the fundamental water supplies and programs of Colorado River basin, or with national and international goals and programs to reduce greenhouse gas emissions that contribute to global warming and regional climate change.